The ranks of Oakland's urban wine tasting rooms are growing with the arrival of Prima Materia Wine. Located at 482 49th St. in Temescal, the newcomer specializes in small-batch wines, with grapes grown at its Lake County vineyards. The venture comes from winemaker and chef Piettro Buttitta, who also plans to incorporate a "rotating small plate" to pair with the wines, according to Eater SF. As things progress, guests can expect monthly multi-course dinners, as well. At the tasting room, located in the former Pain Shop bakery space, customers can taste all nine of the winery's vintages for $15 (waived with the purchase of a bottle), or enjoy a specific wine by the bottle or glass. Varietals include chardonnay and rose, as well as more esoteric Italian grapes like aglianico and negroamaro. With a five-star rating out of three reviews on Yelp so far, Prima Materia is on its way to developing a local fan base. Natalie R., who was among the first Yelpers to review the new spot on February 10, wrote, "The tasting is a great deal and the wine is delicious! The atmosphere is unpretentious, welcoming, and relaxed. " Yelper Lester N. added, "Really nice bar and tasting room with a relaxed neighborhood vibe. The wines are from the estate vineyard in Lake County, Mendocino (I think some fruit is also from Yolo County)." 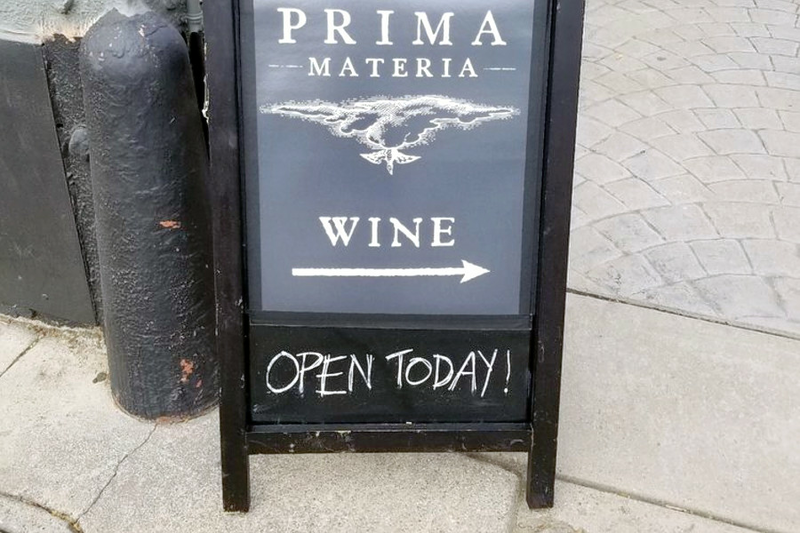 Prima Materia Wine is open from 1-6 p.m. on Thursday and Sunday, and 1-8 p.m. on Friday and Saturday.